Every student has their own unique learning style and finding out what yours is can help you with your English studies. Once you understand how you learn, it is easier to set up your work environment and studying techniques to reflect that, allowing you to get the best out of your ESL lessons. Where not everyone has a learning style that fits into an easy category, below are five general learning styles that cover most students. If you see one that you obviously fit into, you can use the learning tips we’ve included to help you make the most of your English lessons. Pictures, images, and spatial understanding are the preferred learning methods of visual learners. Visual learners excel when they can see their lessons come to life and can often found sitting at the front of the class to get a full view of their teacher’s body language and facial expressions but also to avoid potential obstructions between them and the lesson being presented. Visual learners are often detailed note takers. You do your thinking in pictures and learn best from visual displays, slide shows, posters, clips, and other visual tools. Simple steps like writing an outline of your most recent lesson on a whiteboard using flash cards or creating workboards filled with evocative images can help complex concepts, like English grammar, stick in your mind. Unsurprisingly, auditory learners rely primarily on music and sound for their learning. Information is often best acquired through verbal lectures, discussions, and mini-presentations. As we have discussed in other ESL posts, listening to music in the language you are trying to learn is an excellent way to picking up speech patterns and pronunciations that might not be immediately obvious in printed learning materials. This is especially true for auditory learners. Supplement your usual lessons and textbook learning with following along to English music, watching music videos with subtitles in your native language and listening to duel language ELS teachers on streaming media, such as Youtube. You can also take along recording equipment to record your lessons (ask your instructor for permission first) so you can listen back to them later and strategically integrate audiobooks, songs, and movies into your language learning. Verbal/Linguistic students are those who learn best through words, regardless of whether they are communicated in speech or writing. When learning something new, students who belong to this category prefer hearing a detailed explanation over viewing a physical, visual demonstration. Verbal learners excel in a traditional classroom lecture. However, they can also benefit from interpersonal learning opportunities to interact with words and sounds through discussions, asking questions and teaching others. Try setting up an ESL group outside of lessons where you can meet with others and discuss the areas of English in which you are having difficulty. Blogging and online workboards are also an excellent opportunity to discuss and write about ESL topics. Kinesthetic learners prefer using their body, hands, and sense of touch to explore the world. You might have trouble sitting still for long periods of time and would prefer more lessons that involved group activities with a physical element and props. Creating a series of physical props that represent parts of language lessons is a great way to engage with a language as a physical learner. Much like the visual learner, creating workboards allows you to like physical actions to concepts and, in a group setting, language games, such as charades, are a great way to combine physical activity and learning. Logical and mathematical students prefer using logic and reasoning to understand language. They often excel at concepts like grammar and syntax that have an obvious set of rules that can be identified and followed. As a logical learner, you’ll be at your best when you can break languages down into multi-step processes and data collection. Break things like gender and verb conjugations into tables and charts and create worksheets that incorporate things like geometry and money that have a practical ESL application. The benefits of taking an ESL course are clear. By improving your English skills you gain better access to education, a better earning potential, greater community integration and even better results from healthcare. 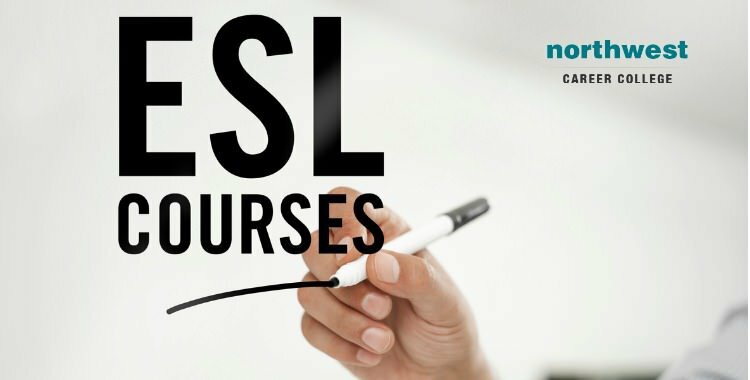 We here at Northwest Career College are committed to enhancing our student’s lives, which is why we are proud to offer our ESL courses free of charge to our students and to extend that offer to their families, friends and all members of the community. Our seasoned language teachers are experienced in working with international students from all over the world and are there to help you get the most from your classes. To help your lessons fit in with your work and home life we also offer day and weekend classes. If you are interested in taking advantage of this excellent opportunity then call one of our ESL enrollment counselors today on (702) 403-1592.